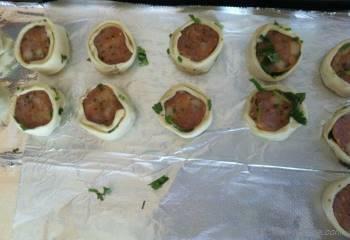 Italian Chicken Sausage wrapped in puff pastry to make small pin wheels and then baked till golden from outside. Cheese in Italian sausage oozes out and sausage get nice caramelized at the bottom to make it an excellent crowed entertainer appetizer. 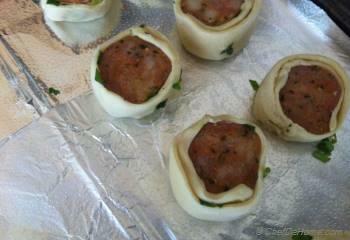 You can wrap sausage in pastry sheet in advance and can even freeze some wrapped pins for later. Remove from freezer just 30 minutes before baking and serve your guests warm, fresh from the oven delicious mini chicken in the blanket. 2. Divide pastry sheet in two halves using sharp knife. Keep one half in refrigerator while you work on first half. Sprinkle 2 tbsp of chopped cilantro on the sheet. 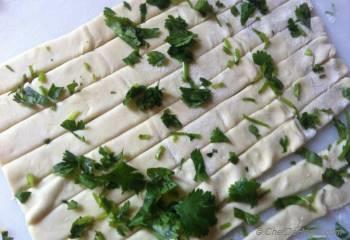 And slice the sheet with sharp knife to half inch wide strips. 3. 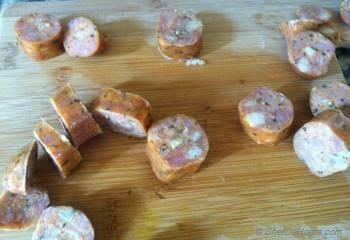 Slice the sausage into 1 inch thick discs. 4. Place a sausage slice on one puff pastry sheet strip and wrap the sheet around the sausage just once or max 1 and 1/2 turns and then cut the ends. Repeat the same with remaining strips and sausage slices. 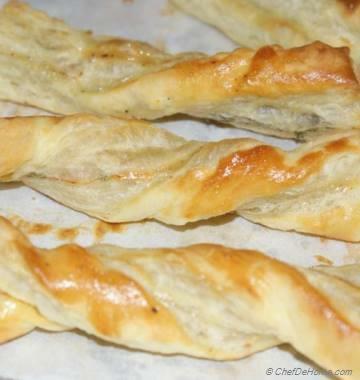 Place on a tray (which can fit in refrigerator) lined with aluminum foil and place in refrigerator while you work on other half of the puff pastry sheet. In order to keep Sausage Pin Wheels small in size, I have just wrapped puff pastry sheet around sausage only one and a half times. However, if you like big wheels, you can repeat the sheet a couple of times. 5. Line a baking sheet with aluminium foil or silicon sheet. Once all sausage are wrapped, place sausage discs on the sheet a little distance apart to give room for rising and expansion. 6. Brush with egg wash and bake in 450 Degree F preheated oven for about 15 minutes. Serve hot and Enjoy!!! 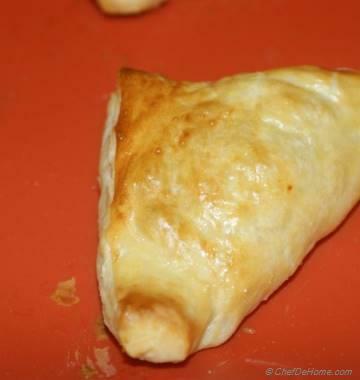 A very exciting recipe and a wonderful finger food. Hi Sonal, thanks for stopping by. It's always fun to host party for kids. You can serve few crackers, new cheetos mix and big bowl of popcorn (kids love popcorn and cheetos) I recently hosted a kid bday bash and ordered Snack of the month from Snack Club of thepopcornfactory.com. They have a different signature treat each month and it was a great hit, kids loved it and so did the adults. Have a good time!!! Hi ChefDeHome, I love you blog. 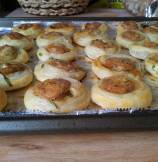 Can you suggest some ready party snacks for a bday party to go along with these homemade chicken pin wheels, I am hosting birthday party for my brother's son next month and looking for good ideas to entertain kids. thanks. Hi Ridha, this recipe works perfect with sausage however if you do not like sausage, then try using Vegan Sausage or sliced smoked ham. 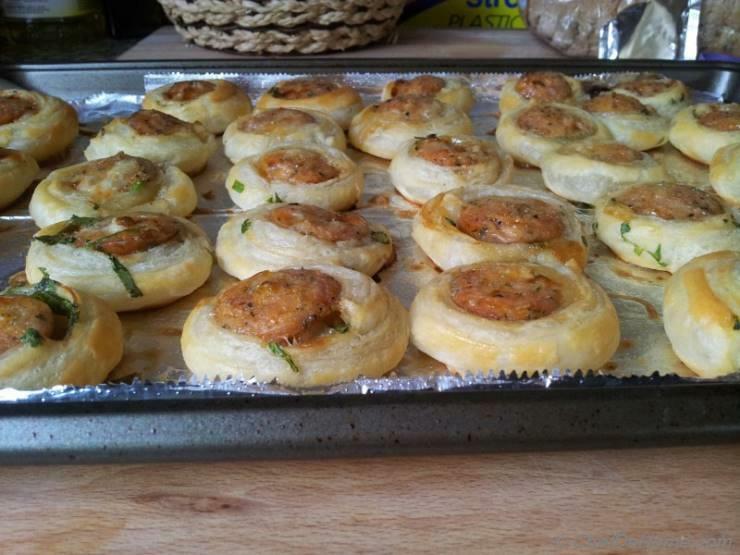 Chicken is my favorite protein but I am not so keen on eating chicken sausage, do you have any other suggestion for this appetizer pin wheels? 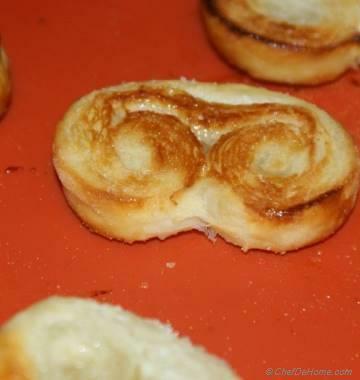 thanks @Corinna, @Paige and @Baking Chick for liking my website and recipe. Whaoo, chicken sausage in puff pastry and chicken in blanket - i heard first time :) I really enjoyed looking through your website. Makes me hungry! I love your website and your recipe collection, you doing good job here. 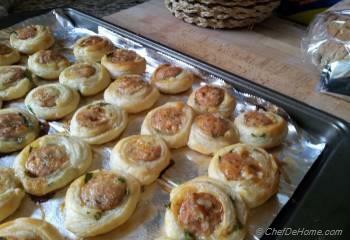 Chicken Pin Wheels look amazing, I will be trying this recipe soon. some delicious looking things happening here that I need to look at. I am always on hunt for good appetizers and this one looks great. I would like sprinkle pinch of Ancho Chili pepper on each for some kick.